Headed to the Lexington Select Sale? The following yearlings have their stem cells stored with Equi-Stem. Equi-Stem’s Tara Long will be on-site to answer any questions, explain about the benefits of storing stem cells with Equi-Stem, and to give information on how to bank your 2017 foals’ umbilical cords. 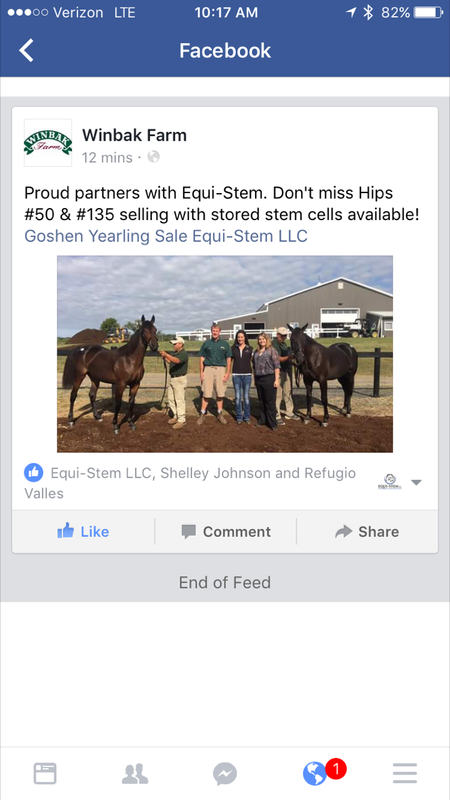 Equi-Stem is at the Goshen, New York sale. The first set of yearlings with stem cells stored at Equi-Stem are going through the sales rings this weekend at both the Ohio Select Sale and Goshen. At the Goshen or the Ohio Select Sale? Don’t miss the opportunity to stop by the Equi-Stem Booth and the following consignors, whose below-listed yearlings currently have stem cells stored at Equi-Stem, to learn about the benefits of storing stem cells with Equi-Stem and to get information on how to bank your 2017 foals’ umbilical cords. Equi-Stem, an equine stem cell bank and stem cell derived product developer, offers the ability to save stem cells found in your horse’s umbilical cord or adipose, for products used in the horse’s maintenance and regenerative repair. Stop by to learn more about what Equi-Stem can do for your horses.